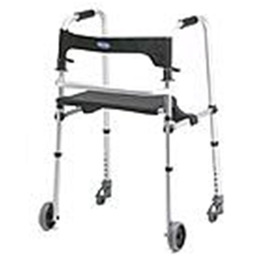 The Invacare WalkLite Walker revolutionized the world of walkers by addressing the needs of providers, clinicians, and consumers at an affordable price. This line of walkers covers a wide range of consumer heights from Junior to Tall Adult. The WalkLite Walker continues to feature all the benefits of the original WalkLite Walker - a comfortable flip-up seat, durable 5" front fixed wheels, rear spring-loaded Invacare® SureGlide™ brakes, a lightweight aluminum frame with flexible backrest and ergonomic dual-paddle folding mechanisms.